Day 5 – Out of the forest and onto the coast! Today was a long day. I have so much trouble finding comfort in the tent, I hardly ever get a good sleep when we camp. Last night was no exception. 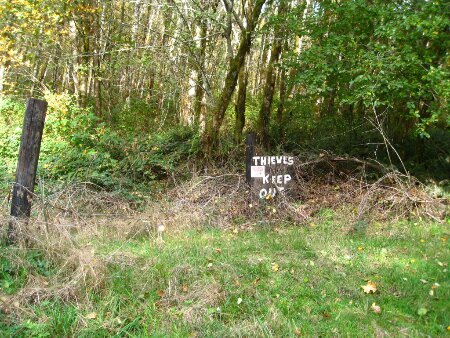 We had chosen to camp about halfway between Eugene and Reedsport, and in between there were absolutely no services of any kind. Our morning started off with a climb up to the Oxbow Summit. We literally started going uphill about a mile into our ride, and we didn’t have any water or a way to treat or filter water. Dallas kept a slow pace, trying to conserve energy, and for once I spent most of the day leading the way, feeling great for how little sleep I had the night before. 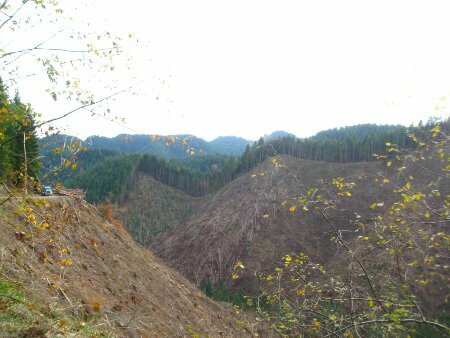 Four and half miles later, we reached a clearcut area of forest where loggers were working. Shortly beyond the logging operation was an RV, and as we pulled up to it a woman stepped out to greet us. 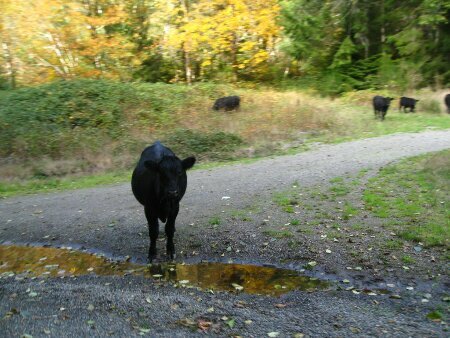 After we asked if there would be anywhere to get water up ahead, she offered to give us some water. We are so grateful for this, because we still hadn’t reached the top of Oxbow hill and we weren’t going to see anywhere to get water for another 40 miles. We talked to the woman and her husband for a few minutes – they were watching after the logging equipment while the workers were off duty, and had been in that spot for about 6 weeks already. It’s kind of sad to see them cutting down the trees, but apparently this area that is being logged was burnt in a forest fire in 1966 and is all second growth forest within the last 50 years. 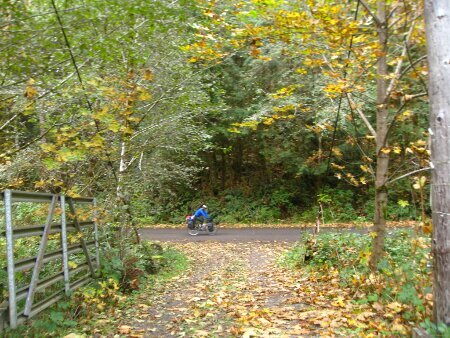 We finally reached Oxbow Summit, and from there most of our ride was relatively flat, but we weren’t through the hills just yet. We stopped for lunch, which consisted of an apple with almond butter, cheese, hazelnuts we gleaned from a farm a few days ago, and chocolate. My stomach was grumbling again probably thirty minutes later. Even though we were both starving at mile 25, we agreed to wait until mile 40 before eating the rest of our food, but at mile 38, there was a nice spot to sit off the road, in the sun, and halfway up a pretty steep hill. We finished off our last two packets of tuna salad and the rest of our crackers, and one more baby bel of cheese each. Halfway down the other side of this hill, about a mile after we stopped to eat, there was a little convenience store. We were still in a zone without phone service or internet, but there was an ATM here. We tried to take out $80, but the machine returned $4. It was filled with one dollar bills instead of twenties! Thankfully, the lady at the store apologized for this and replaced the ones with twenties for us. After refueling on water, sugar and caffeine, Dallas was a rocket. I could not keep up with him for the rest of the day. I had been feeling like my legs have gotten much stronger in the last few days, and the rest day really helped. Now I felt deflated and wanted to give up. Dallas stayed with me though, and we made it to the end of Smith River Road where it met up with Pacific Coast Highway 101. 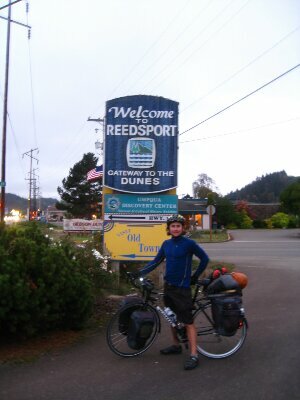 Turning south onto this road, we had made it to Reedsport! We made a stop a Safeway to stock up on more food, and by this time it was dark. Dallas had told me about a lighthouse he really liked when he was riding down the coast two years ago, and it just so happens that we were only 5 miles from that lighthouse. Also coincidentally, we ended up getting there exactly two years to the day after Dallas had visited it himself! The Umpqua Lighthouse is pretty awesome. It’s also impossible to photograph so I’ll just have to describe it (but you really have to see it to appreciate how cool it is). We had to climb a nasty hill in the dark to get to it. It’s bright red and white beams of light point downwards to the ocean below, and rotate like a carousel, hitting the trees behind it. Now we are camping in the same spot that Dallas camped two years ago, and are once again the only hiker/bikers at this campsite. There is a constant howling or whistling of some sort in the background. The wind, maybe? The lighthouse? After a long day of cycling over 62 miles of hilly forest roads, I just hope I sleep better tonight! 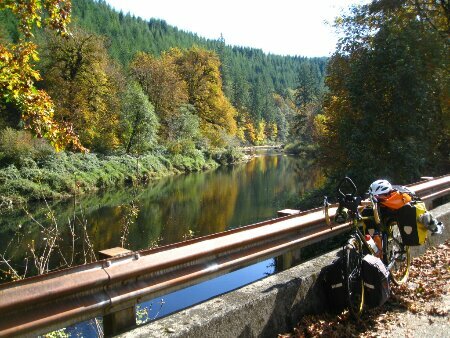 Posted on 11 October 2013, in Bicycle Touring, Portland to San Francisco and tagged bicycle, bicycling, bike tour, cycling, forest, logging, national forest, Reedsport, Siuslaw, tour, touring, Umpqua Lighthouse. Bookmark the permalink. Leave a comment.